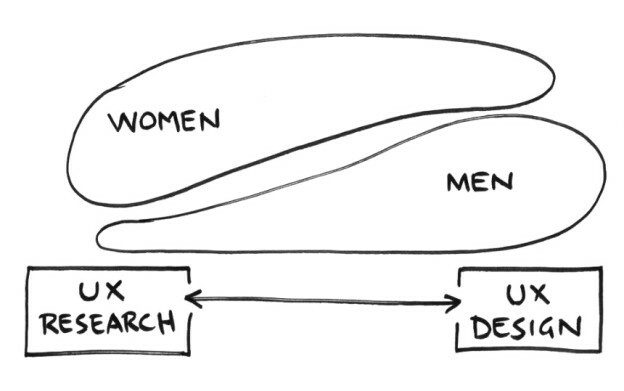 Does UX research attract more women than men? I sometimes refer to the various roles within UX as running along a spectrum from research at one end to design at the other. It might be more convenient than realistic, but I’ve found it’s a pretty solid metaphor when asking colleagues where along the spectrum their deep skill-set lies or where they have the most fun. …but I’d never considered each end of the spectrum might attract a different gender. 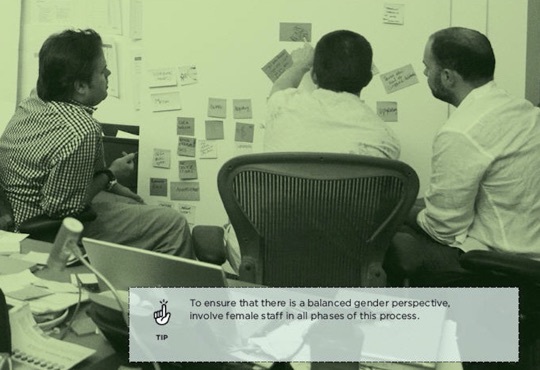 In fact, after moving from earlier careers of men and machines, I’ve enjoyed working in what’s seemed like a gender-balanced environment of UX / user centred design. I’ve even spoken out before on this when I’ve felt things weren’t quite representative. So last month when speaking about visualising design research to audiences in New York and San Francisco I was surprised to notice men were significantly out-numbered by women. Another talk, only two men. This made me wonder… was this representative of the profession? In this ‘People understanding company’ in Europe, women outnumber men two to one. A search for ‘design researcher’ in the SF Bay Area returns 26 women and 4 men in the first 30 results. What is it about the profession, that attracts more women than men? Is it that women are somehow suited to design research? Why is that? Has it always been this way, or is it changing? What does it say about the other end of the spectrum? And – on a professionally embarrassing note – how did I miss such a fundamental demographic trend in my own industry, given that spotting patterns in people is a core part of my work? Perhaps some of you lovely men AND women readers can answer some of these curly questions? 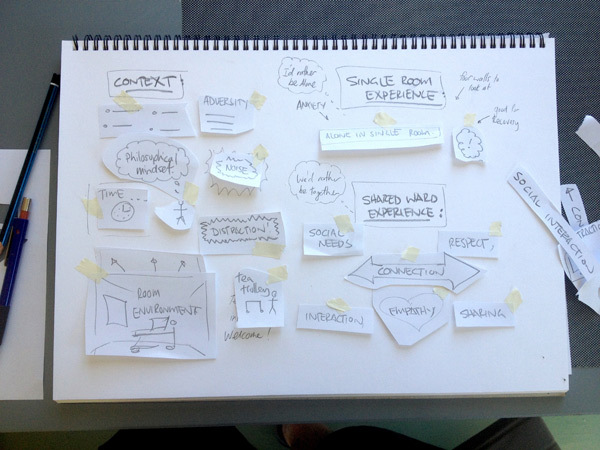 This entry was posted in Design research, Observations, User Centered Design, User research by Nick. In this article I’ll walk through my process and the tools I use, in the hope you can do something similar for your clients. This is also a way to share some of the content of a few talks I gave in NY and SF in 2015, about visualising design research. My talk ran through how I’ve blended communication styles from former careers in art and architecture to communicate the types of insights we find in UX research projects, where I’ve found traditional reports just don’t cut it. One thing I wanted to be sure my audiences took away was a feeling of “I could totally give that a go on my next project”. So if after reading this article you’re not thinking like that, I’ve missed the mark. Doh. 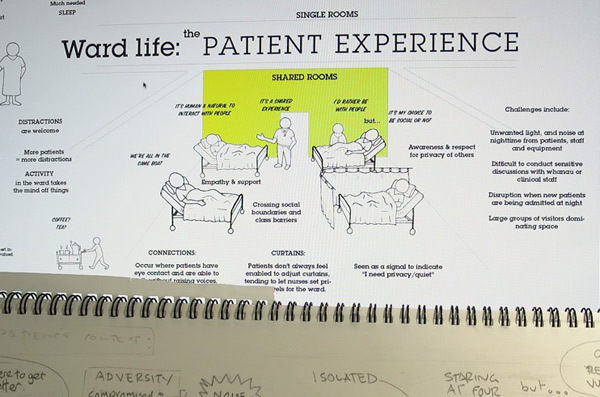 For ‘Ward life’, a project for a healthcare client – I was asked for only visual deliverables, as the team found the video/poster combo so compelling on our previous project it left the report in the dust. Knowing there would be a visual at the end, I photographed the process so I could share it. 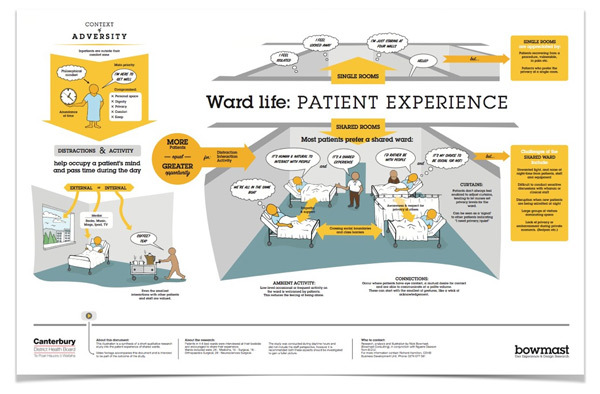 The goal was to understand the social and emotional experience of patients in a shared hospital ward situation. 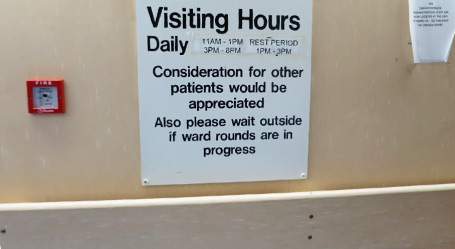 I partnered with a chaperone (who’s also a natural interviewer) and we hit the wards – spoke to nurses, patients, their families etc., emerging later with insights – as you do. 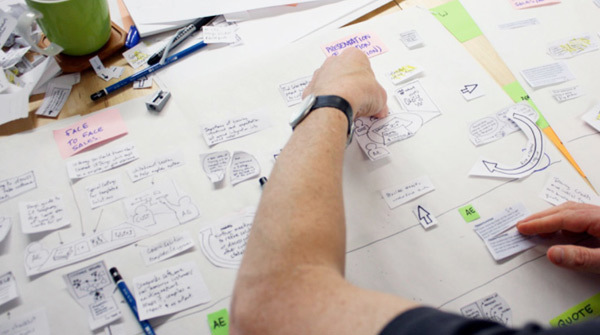 FIRST: Lay out your key insights. These can be single words, or statements. Arrange these in a way which best frames the messages you want to communicate. Group around themes and sub-themes, relationships, this one feeds into that one etc. While doing this I’m thinking of a narrative. A starting point and the flow, or the way I want the viewer to take in the content. 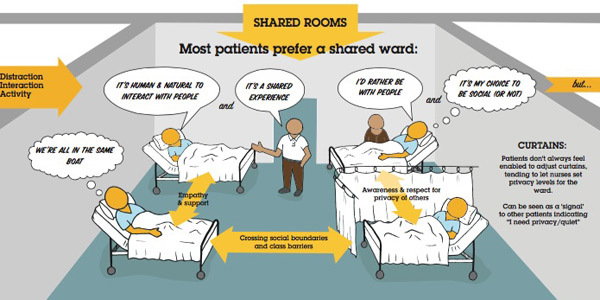 The psycho-social aspects of being in the shared ward, and in a single room. … and as I’m doing it I’m realising, how these relate to each other. 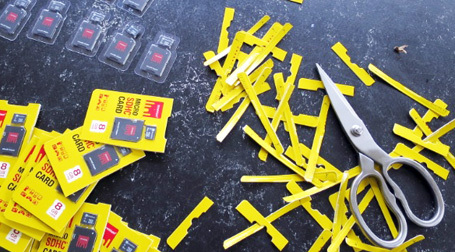 This is a bit like ‘storyboarding’ – you’re essentially weaving a story, frame by frame. 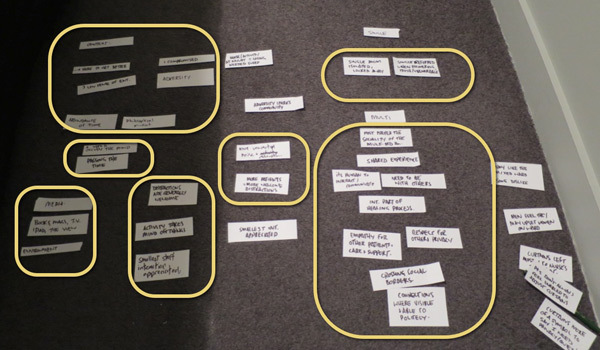 I’ve found moving the parts around directly on paper is a great way to build a story, and helps me join the dots between the things I’ve found and what they mean. You’ll need to be acting out a dialogue in your mind, between the content and the audience… converting this dialogue into a visual format. Think about the story you want to tell, where you want to place the accent and importance, and the quotes you want to use (speech or thought bubbles). 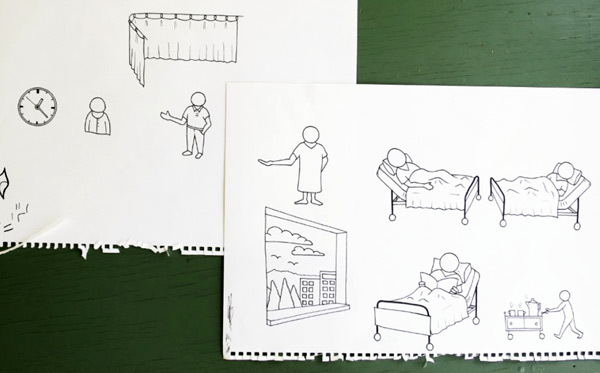 Rather than drawing all the ‘things’ I’ve just drawn text boxes or a description of what it should convey, like here it might be ’Patient in bed with ipad’ so my collaborators have an idea what I’m thinking. This is the part where you literally put the people in the picture and think about the words and phrases you want to use. Your audience will be drawn to illustrations of people and the text immediately connected to these, so give thought to where you want this attention. 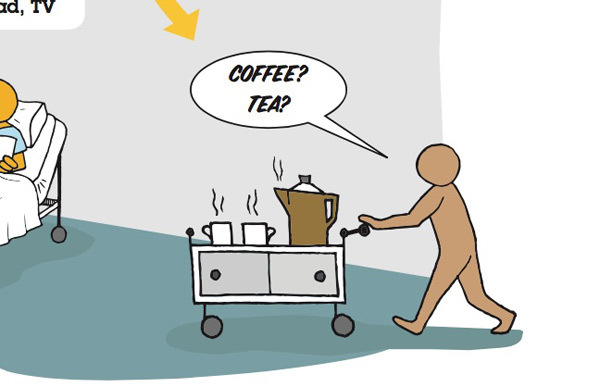 At this stage I use a few stick or bubble figures with speech bubbles as placeholders to give myself, (and sometimes a client) a sense of how we could portray what’s going on in the moments / interactions in the patients’ world. Make a list, and go shopping. When I’m feeling happy with the arrangement and have an idea of which parts of the story should be supported by illustrations , it’s time to give the stick figures an upgrade. I literally list out all the drawings I need and think about which ones I can draw, and which ones I’ll need help for. And when I say help, I mean Google Image Search. Here I typed in ‘Hospital bed’ to get an idea how these looked from a couple of angles. If you’re not so confident at drawing these things from screen, try printing them out and tracing them. Just hold them up to a window if it’s from a photo. I try to avoid drawing busy scenes, so reduce illustrated elements to only where they will add value and support the narrative. As you can imagine a finer level of detail can be handy at times, for example I could have had a stethoscope round the neck to identify a doctor in this image, but it wasn’t important enough to add it. By the end of this you should have line drawings on paper ready to be scanned so you can put them into a digital document. Open up a layout program that handles images and text. (I use Adobe Indesign) and set a massive document size. This one was about 1400mm wide x 900mm high. (You’re going to print this out BIG). From here, use the ‘Text box’ tool to add in all your text as individual elements, then import your scanned drawings and go to work arranging these, being faithful to your paper mock-up. Ok, it’s bit of a high-falooting word, but once I’ve got all the content loosely arranged I usually go about assigning a few type ‘styles’ so I can use sizing and bold etc. 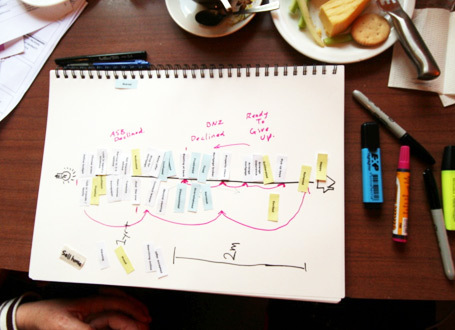 Creating this visual hierachy adds prominence and weight where it’s needed. … then assign extra weight to those elements. It’s not just a matter of making things bigger, sometimes giving more space around them can help with this. 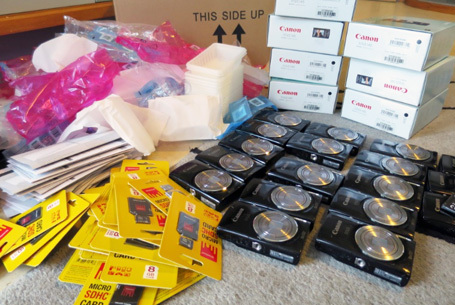 It’s no coincidence that software toolkits have boxes, arrows, shapes and lines. This combo (and text of course) is all you really need, and doesn’t take long to get the hang of. In this visual I’ve used boxes to say ‘these belong together’ some triangles for big arrow heads, and for the floor and walls I used the line tool where you just keep clicking corner points, then choose a colour for the ‘fill’. After text and speech bubbles, (an oval and a triangle joined together) arrows are one of the hardest working tools in the box – particularly for non-linear artefacts like this one. They help guide the viewer around, and show the links and sequence of things. Indesign or even much less sophisticated programmes will have an easy toolbox and menu of line and arrow types, thin ones, fat ones… Mix it up! I keep things in black-white and greys as long as possible to make sure the message is getting across without colour, then go to Adobe Kuler to pick a palette of 3-5 colours, using some to add depth, and one or two for accents. I recommend you call your local print shop, ask them how wide their roll is, and make this the shortest dimension of the printout. A ‘wall sized’ visual (as opposed to individual A3 printouts) gets more eyeballs. 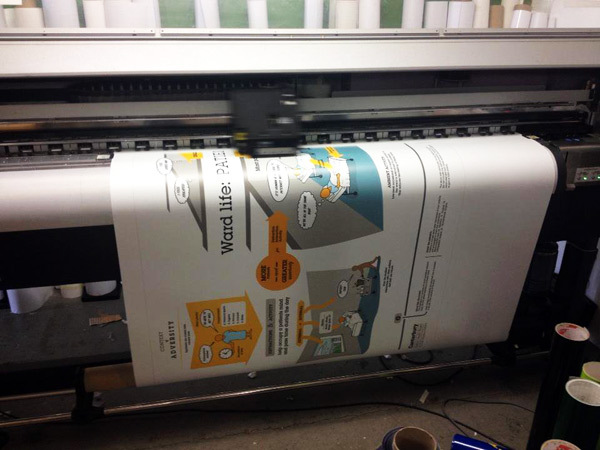 A poster provides a shared experience, get’s people out of their seat and generates the sort of response and conversation that matters to your project. If you’ve read this far, you probably agree that ‘generating conversations that matter’ is a job text based reports all-too-often fail at. So …pick up your pencil and start a conversation. 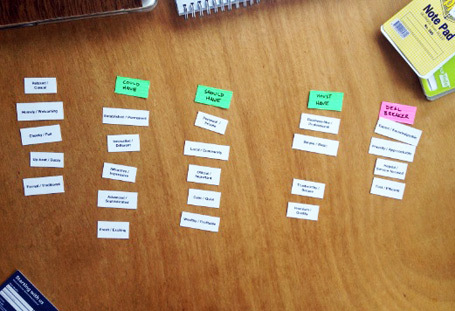 This entry was posted in Customer insights, Design process, Design research, User research, UX methods, Visualising research by Nick. 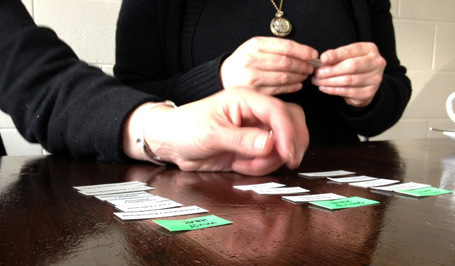 …We’re all born with these essential three tools for user research. The proportions are about right too. …until your eyes get busy looking at the notes you’re taking rather than observing behaviours and maintaining eye contact during the interview. 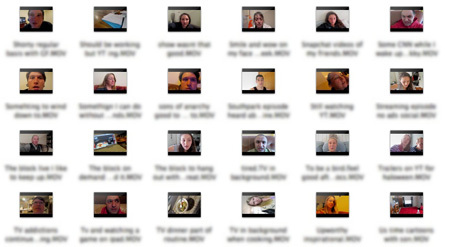 If you’re a solo researcher, electronic eyes and ears are useful too, but it’s a depressing reality that from one hour of interview footage there may only be a few minutes from the recording that are used to frame your insights later. 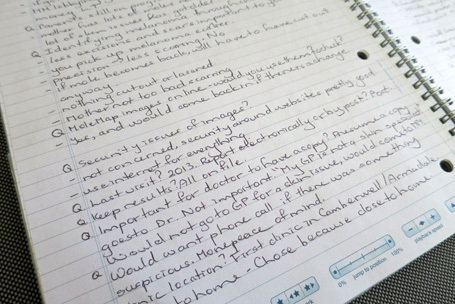 If you’re taking notes like this AND trying to interview someone… you’re missing the point. 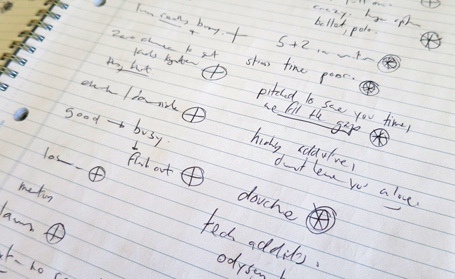 Capturing verbatim notes comes at the cost of having an only halfway natural conversation. 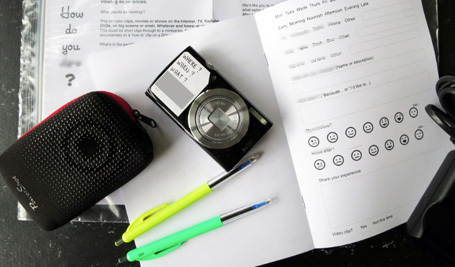 This is why despite experimenting with many approaches and technologies, I keep coming back to using a smarten to take notes during fieldwork, or even usability testing products. 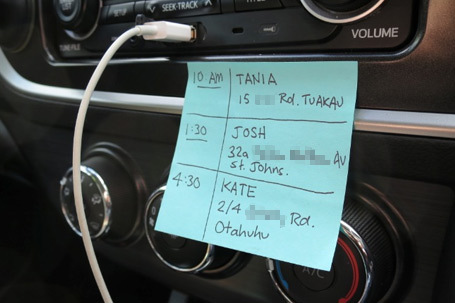 A smartpen lets me focus on the conversation, then just nip back to highlighted moments later. 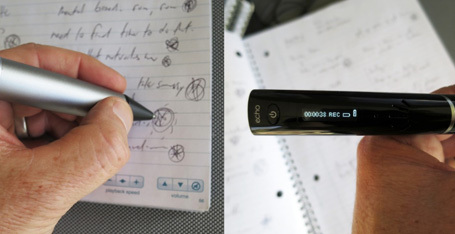 It records audio as you scribble, synchronising the audio to the marks you make on the page. This frees my eyes to pick up on body language, expressions and mannerisms, and think about where the conversation is going … meanwhile, I’m highlighting key moments in the conversation, for quick and easy recall after the session. Having the exact wording wrapped in the tone of voice from the moment, at the tap of the pen is simply brilliant. I scribble squiggly circles next to key words according to the ‘weight’ of the moment, in the moment. More circles means more emotion / intensity etc. I might write down a short quote if I can do so without any interruption to the flow, but I’m much more likely to jot down a keyword or phrase as the person is talking, holding their gaze while drawing a star or squiggle etc. In an ideal world I don’t take notes at all. I film the whole session and transcribe it while reviewing the video footage. This allows total focus during the interview and is a great way to re-immerse in the moment, but it can be a painful trawl through the footage to pin-point those moments or killer quotes for an edited video. So my new default is to get the smarten AND the video camera rolling at the same time. As I’m going back to ‘tap and play’ my notes, I can read the time code from the little screen on the pen. Having this time code makes a total doddle out of pulling together a ‘highlights’ clip from acres of footage. Tap – and Boom! you’re back in the moment to the nearest second. Best of all – knowing all the goodness is being captured and I can cherry-pick the best bits later means I’m able to relax during the interview and build real rapport with the person, and frees up my eyes to do their job. 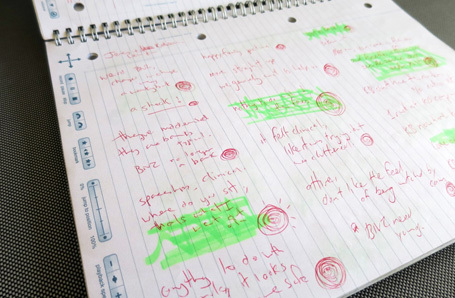 At the end of an hour of interviewing, I might have 2 or max 3 sides of pretty scrawly notes on an A4 pad with a couple of dozen scribbly dots of different sizes, some underlined words, maybe some little sketches or doodles .. and it’s all time linked to audio. Nobody could understand the notes but me… but it just so so rich with the audio accompaniment. 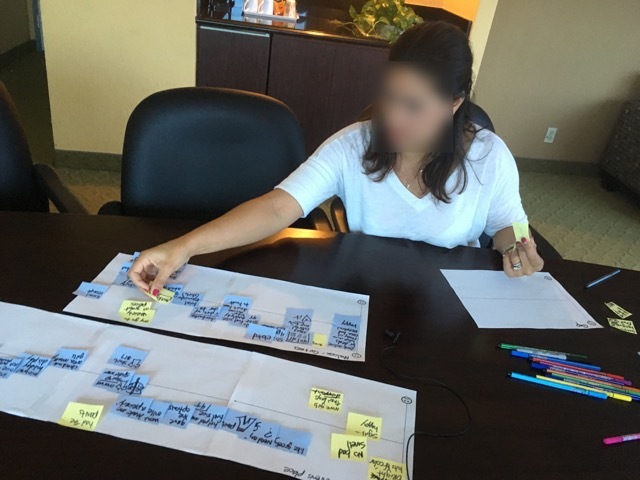 How do you handle the dual task of note taking and interviewing when flying solo during in-home customer experience research? Meanwhile, I’ve got my Two, Two and One… plus the smartpen. 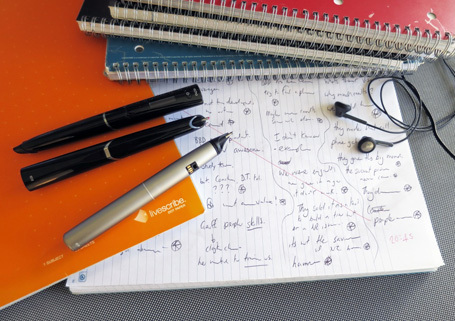 The one I use is called a Livescribe , and in the 5 years I’ve been using them they’ve developed a raft of additional functionality, but I literally only use the pen to record and playback, but if anyone’s found a reason to use the extra wifi whizz-bang, I’m all ears. 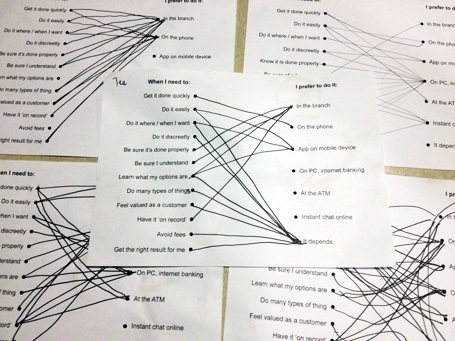 This entry was posted in Design ethnography, Design research, User research by Nick. How can a product team gain empathy for their customers and draw meaningful insights if they aren’t driven by their own curiosity? I generally encourage clients to ride shotgun with me during fieldwork. It’s an engaging way for them to meet their customers, get inside their heads and fall in love with their problems. 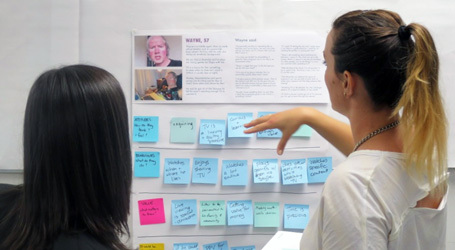 Increasingly these teams want a lasting version of design research goodness – learning how to do it for themselves – often as part of a broader move to a customer-centred mindset, and as a rule I’m all-for passing on my approach and techniques. But where to start? I’m self-taught through running dozens of these projects without a scrap of training, or ever reading a book, so how should I go about passing this goodness on to my clients? With a mild dose of impostor syndrome, I initially tried up-front ‘ethnography 101’ style coaching, role-playing, ‘primer’ exercises, guerilla research and even wrote ‘how-to’ field guides covering interview and recording techniques etc. – only to be disappointed. So, why weren’t all these client teams as interested in their own customers as I was? If in doubt – consult your manual? These books are great fodder for the aspiring or even seasoned researcher, reminding you that what you do actually is ‘a thing’ …(and you can even call it ethnography) but having tried a few methods of ‘coaching’ I’m not convinced any amount of reading can move the needle on your clients’ curiosity-meter. 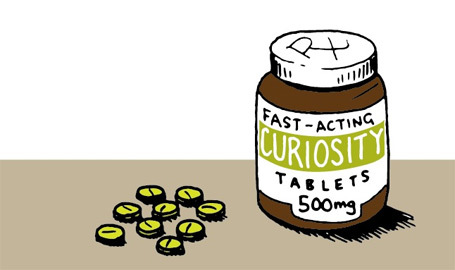 …in fact latent curiosity seems all-too-rare regardless how much permission and context you provide or how well you prepare teams upfront to ‘go ethno’. Exposure to customer-world can ignite this desire to learn, but even well-intentioned members of a product team can fail to gain empathy with their customers or draw meaningful insights if they aren’t driven by their own desire to learn. Yes, that glimmer of curiosity in your clients’ eye is worth more than all the ‘how to’ books ever published, and on these assignments, my goal is to bring that out in my client. Tossing the books aside, I’ve found it’s way simpler than I thought. Review and share learnings as you go. Fuel and follow your team’s curiosity. It seems all the tips, techniques, handbooks and best intentions aside, it seems real world experience sorts the ‘men from the boys’ in terms of building this desire to learn. …But the changing and unpredictable nature of peoples’ behaviours and now knowing what you’re going to learn is addictive, and the curiosity and drive to dig deeper can spread by osmosis. So if you’re in a ‘coaching’ role, show them the rewards and they’ll want to make the investment in learning the skills. 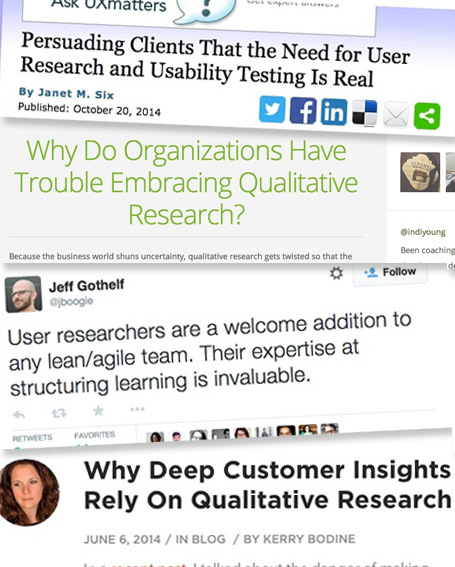 How have you managed to up-skill your clients in user research? Has this been deliberate, at their request, or a useful bi-product of attending your fieldwork? 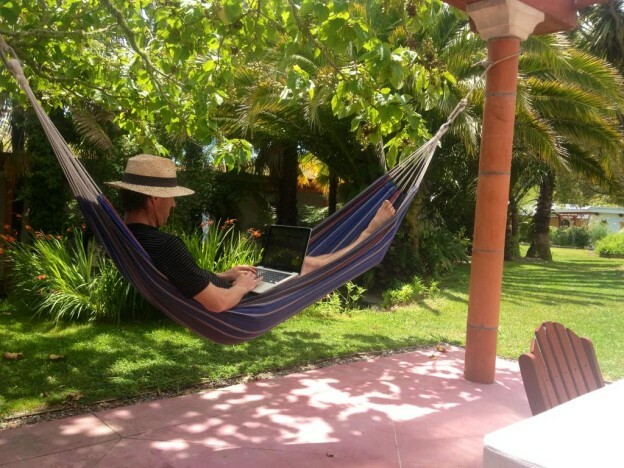 This entry was posted in Customer insights, Design ethnography, Design research, Insights, Mentoring in UX, User research by Nick. 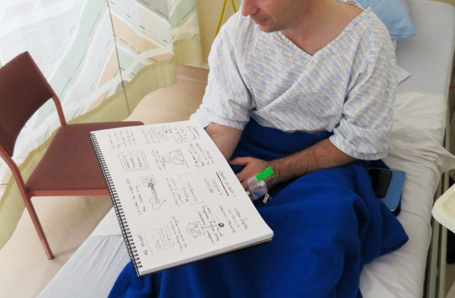 Respect, instinct and bedside manner – My patient experience toolkit. 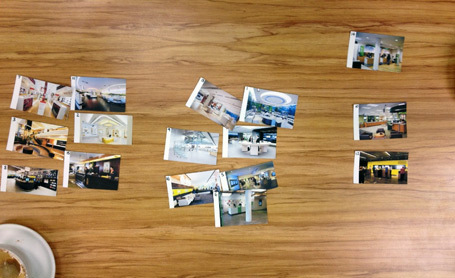 Design research in a hospital environment is super rewarding. You’ll reveal a wealth of insight and opportunity to improve patient experience but face some unique challenges, especially when interviewing patients at their bedsides. This work will squish everything you’ve got in your soft skill set. You’ll be relying on your instinct for what’s ‘right’ and ‘polite’ in the circumstance. I think doctors call this ‘bedside manner’ …you’re going to need a good one. Be considerate – happy hour or not. It goes without saying to be sensitive to this context. You’re asking people to share their thoughts or story when out of their comfort zone and feeling vulnerable, emotional, philosophical or all of the above. Try to relax patients – make them comfortable, offer to top up their water, pass things, adjust curtains, charge their phone. I prefer to ‘cold call’ on patients at their bedside, inviting them to share their experience on the spot. This lacks the certainty of ‘appointments’ but adds in-the-moment authenticity you simply don’t get if you give people the chance to collect their thoughts and arrange themselves in advance. A chatty, social ward is a good place to find stories. 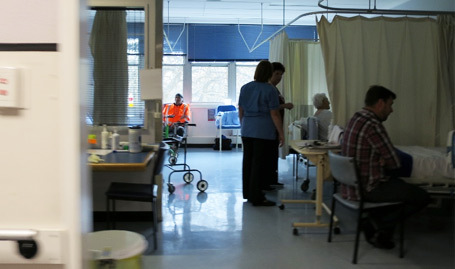 Each ward or room has it’s own atmosphere, from patients trying to sleep while machines gently beep, through to chat and laughter of visiting families. You’ll need to quickly read the mood and adjust your tone and approach to suit. Pick a lively, social ward and you might find patients are more willing to participate. (but beware of the bias this introduces). While you’re building empathy for each patient’s circumstance and viewpoint, some of their emotional load will shift to you by osmosis. This is a sign you’re doing a great job of listening, but be ready for emotional exhaustion at the end of each day. To avoid becoming a patient myself, I start necking immune boosters and vitamin C the week before this work and wash your hands frequently during each day. It’s essential ward staff know who you are, and what you’re doing in their working space. I’ve always had a chaperone who’s known and trusted by the staff introduce me and the project objectives. 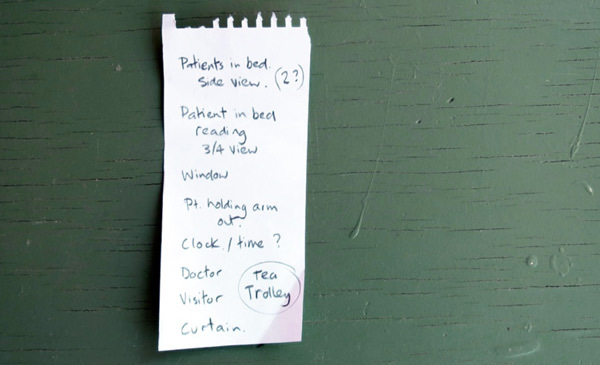 Without this, nurses will be suspicious of who you are and what you’re up to. Patients will assume you’re clinical staff, a specialist, or coming to discharge them, so get any expectation out of the way as part of your greeting. 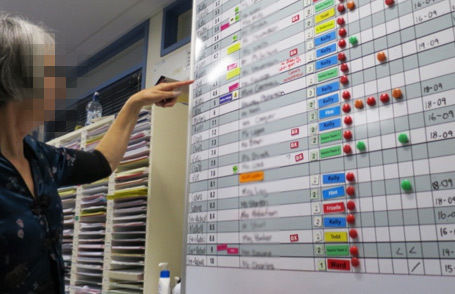 Ward staff will point you to the most appropriate patients to talk to, and those to avoid. Ask staff to suggest which patients are appropriate, and not appropriate to approach. This can save embarrassment for you and patients if they are not completely ‘with it’. Maintaining eye contact and looking for non-verbals is essential in this context. 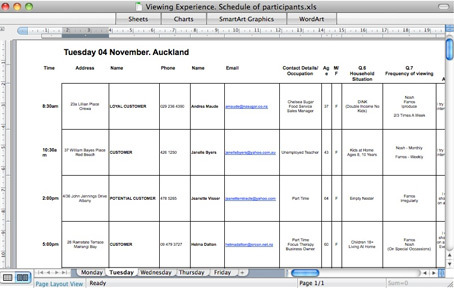 You’ll need to record each interview and review later, or bring a note taker. 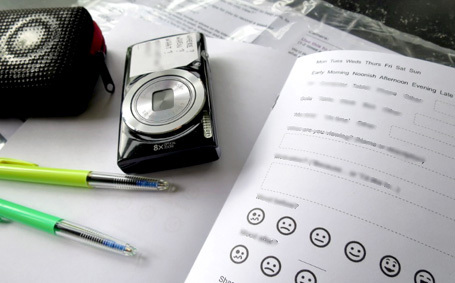 If it’s your turn to take notes, sketch-noting works very well for feelings, emotions, environmental factors etc. and is super easy to socialise later. 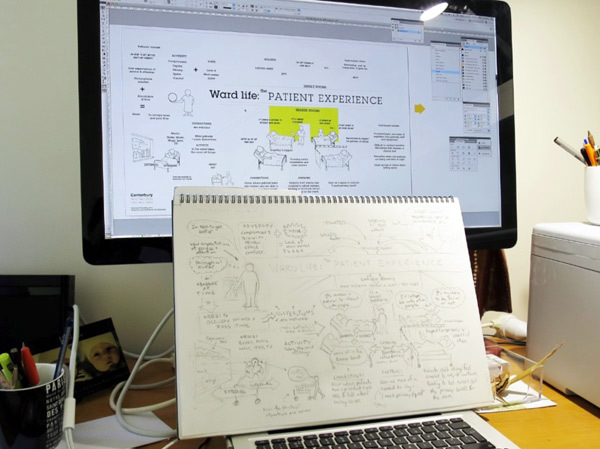 Patients love to see what all that doodling was about, and will elaborate on aspects given the chance. Ask for permission to interview the patients after discharge in their homes. The in-context interview will be revealing, but you’ll hear a different perspective and mood when they reflect on their in-ward experience. 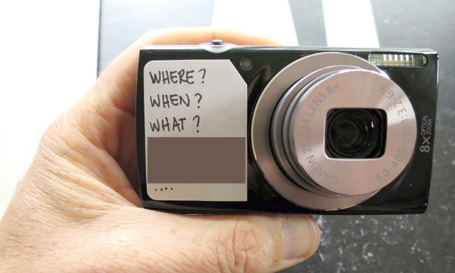 Cameras are an even bigger distraction than usual on a hospital ward, so if you’re filming interviews (and it can be very compelling footage in this context) conceal your camera until you have each patient’s permission to film. Clear audio is a priority. 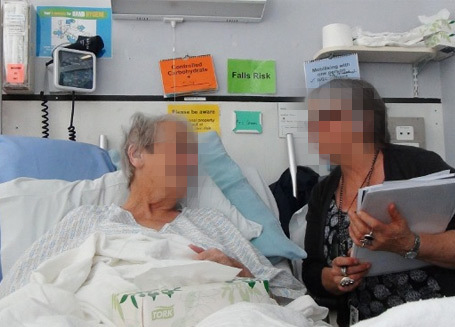 Patients in a shared ward will tend to whisper out of respect for privacy of others, or so as not to be eavesdropped. Go for a wireless lapel microphone or at least a directional one. 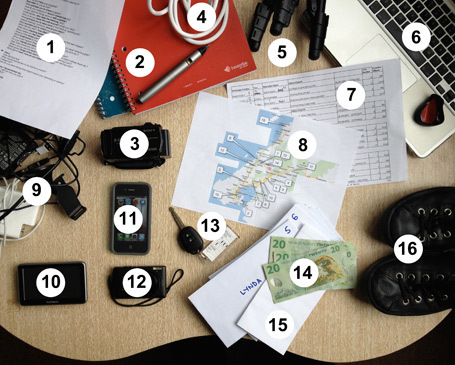 Check out my article ‘Ethno unpacked – A design researcher’s toolkit‘ for details of the gear I use. The more I work in this context, the more I feel like a newbie, and there’s much more to learn. 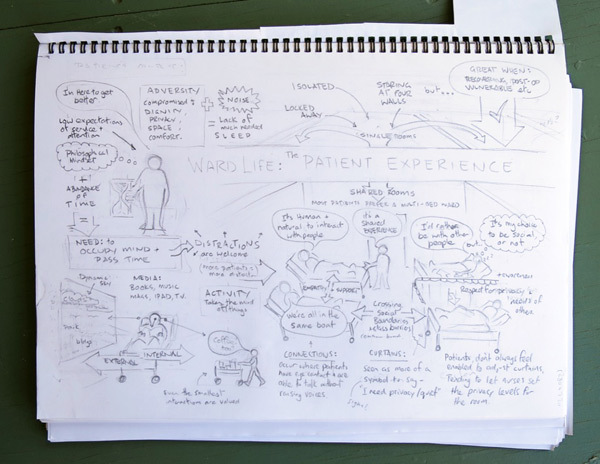 This entry was posted in Design ethnography, Design research, Favourite projects, Patient experience, User research, UX methods by Nick.